.Quiltscapes. : March Quilty Madness. A recap. March Quilty Madness. A recap. Thanks to all those who took the time to comment on the giveaway the other day to share how you began your quilting journey - and what quilty things you did in celebration of National Quilt Day this month! Wonderful stories - lots of creating and sharing going on in the quilt world - one stitch at a time. 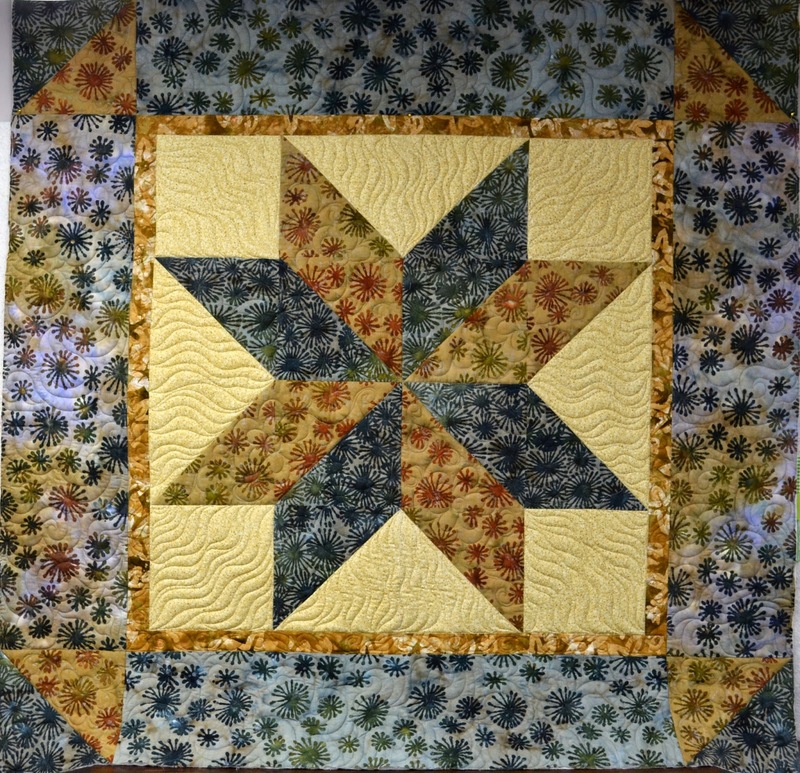 Daughter Chelsea made this batik Star Medallion lap quilt top about 6 years ago. She drew out the quilting motifs for me to quilt and calls it her "Carpenter's Daughter." She's my binding expert and finished it herself. Yay - it's done! Added a new sewing machine to the collection... Isn't she a cutie? I finally set about organizing the sewing room chaos in to a respectable space to welcome friends, complete with little stores of chocolate. Even my husband pitched in. First he worked on my Mom's old buffet, then he got out a rotary cutter (!) I know, right? Bless his heart. He's been cutting out more Carpetbag kits. Maybe it was the chocolate? Daughters, friends, neighbors and guild sisters have stopped by. Some of them stayed into the wee hours (one friend and her daughters quilted all night long! ), because we just can't get enough quilty goodness, I guess. We've tested a few new patterns. In addition, I attended the annual USU Sewing Training for FACS (Home Ec) teachers and 4-H leaders from around the state, teaching my version of an orange peel / faux cathedral window table runner from the RBD Circles video. My girls and I presented our trunk show, "Generations" for a group in Salt Lake City. "Hearts Stitched Together in Unity and Love" was the theme. Attended my Longarm Quilt Guild meeting where someone I didn't know had found my free pattern online, made it, quilted it and brought it for Sew & Tell! Whew, what a month! And like one of the comments the other day, "Isn't every day Quilting Day?" My answer is YES. I spied you in the Choir! It was fun to see you Saturday and Sunday on my TV. You have had a very Busy Month. Hope you get a few minutes to rest now. you certainly had a great march, so much to enjoy there. The faux cathedral window runners look so good ut is amazing how different they look from one another with the different fabrics. Usually I too try and have a bit of sewing every day, yesterday I am afraid I failed as had to tackle a mountain of weeds in the garden! Love the blue Japanese machine. Cute! Cute!